I spoke to Jon Townsend, a living historian and YouTuber who runs the Townsends YouTube channel which is dedicated to exploring the 18th century lifestyle. He is also the owner of Jas. Townsend & Son Inc., a shop which sells 18th and early 19th century clothing and accessories. Mary Ann Mahoney: Hi Jon! Thank you for taking the time to talk with me today. Jon Townsend: Thank you for giving me the opportunity to share what we do. MAM: Can you describe your YouTube channel for those who don’t yet know about it? JT: We concentrate on what it was like to live in the 18th century, specifically from about 1750 to 1820. MAM: What made you decide to start a YouTube channel? JT: We created the channel to help our re-enactor customers learn about and use our products. MAM: Your father, James, was interested in living history in the 1970s. What was so fascinating to you about the 18th century that you wanted to be a living historian? JT: I grew up learning and doing living history, so it was a natural outcome. MAM: Can you explain to our readers the difference between a historical re-enactor and a living historian? JT: There is a tremendous quantity of crossover and the definitions can be a bit difficult to nail down, but I would say a living historian is a much broader term. The living historian is more concerned with the entirety of thoughts and actions of a time and place in history and the experience of thinking those thoughts and doing those actions. MAM: Did you start out with cooking videos? 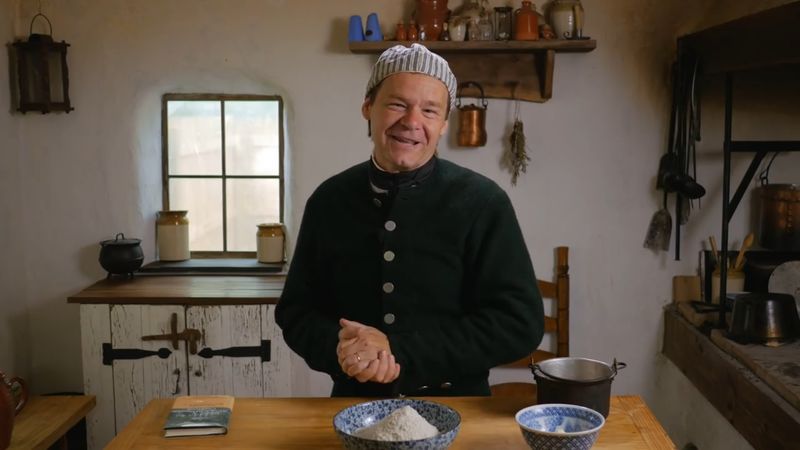 JT:I was always fascinated by the old 18th century cookbooks and it seemed like a logical thing to do on the YouTube channel. MAM:Have you always been interested in cooking? JT: No, cooking hasn’t really been a separate interest to me. MAM: How did you get into cooking in the first place? JT: I started right out working with historical recipes. MAM: Some of the recipes in your videos look fantastic. What is your favourite and least favourite recipe? JT: I enjoy the great majority of the items we cook, but I especially enjoy the deserts like “Whitepot”. As for least favourite, bread made with peas. MAM: What is your favourite cookbook to get recipes from? JT: There are so many, it is hard to choose. If I only had to choose one, I would probably go with The Art of Cookery by Hannah Glasse. MAM: Is there anybody from the 18th and 19th centuries who you particularly admire? JT: Life was so incredibly different back then that I have a hard time picking out just one or two people. Every time I pick up a book and read first-hand accounts from the 18th century, I admire everyone how just lived. MAM: Is there anybody currently living that you want to shine the spotlight on/ bring attention to or thank? JT: I meet so many dedicated museum and historic site workers; they work so hard for so little that I am always awe. MAM: I noticed in your videos that you often have guests and have even had your daughter, Ivy, in your videos. Are your friends and family as enthusiastic about living history as you are? JT: I have a lot of great friends who share my enthusiasm for living history and Ivy really loves going to the events and participating in the videos. MAM: Do you share your father’s enthusiasm for shooting? JT: I enjoy it, but I don’t get to do it very often. MAM: People’s lifestyles have changed since the 18th century. What do your children think of 18th century life? JT: A typical child’s life was much more connected with adult life during that time. Children were expected to work and be trained to do adult work much earlier than today. I am sure they still had fun, but I get the impression that it was a bit more serious. MAM: You don’t display advertisements or commercials on your YouTube channel. What was the train of thought behind this? Making education accessible? JT: We do a bit of advertising on the channel and we do point people to our ecommerce website, but it is mostly about exposing modern people to 18th century living. MAM: You also sell reproductions of 18th and 19th century cookware, accessories, equipment, clothing etc. on your online store and at your Jas. Townsend & Son Inc. brick-and-mortar store in Indiana. Can you tell us a bit more about your website and store? JT: We have been selling 18th century clothing and accoutrements to reenactors, historical sites and movies for over 40 years. We work with craftsmen from around the country and many of the items we make right here in Indiana. We try to supply historical items that you can use every day. It’s fun but there are many challenges. MAM: Do you get many customers at your store from people who aren’t historical re-enactors or aren’t interested in living history? JT: We certainly get a few, and some come from hundreds of miles away, mostly brought to our store because of the YouTube channel. MAM: Your store sounds incredibly successful! Your YouTube channel also seems to follow with the same success. Do you have any plans to open a café or restaurant in the future? JT: No, that sounds like way too much work. MAM: Is re-enacting and living history popular in Indiana? Are there any popular groups or living history/ re-enacting societies? JT: It is somewhat popular here. There are quite a few groups that specialize in different time periods or occupations. MAM: What is your favourite part of living history? JT: I love discovering something new while researching and I also love meeting so many wonderful people that are excited about history. MAM: Do you think that people yearn for a more simplistic lifestyle deep down as modern life is so hectic and complex? JT: I am positive of that. MAM: With living history there’s a certain safety where you can pick and choose what you want to experience without committing to it as a complete lifestyle; as there any aspects of 18th and 19th century living that you really dislike that you avoid or make you glad that you can re-enact it in the comfort of the 21st century rather than live it? JT: Everything has “the good” and “the bad”. There is plenty to learn from the 18th century in the negative sense; things that we should never want to emulate. We study history to learn from both the positive and the negative. MAM: Are there any other time periods you’re interested in? JT: I can get excited about most other time periods, especially in how they are similar or very different from our time period or the 18th century. MAM: It’s been great chatting to you! I feel like I’ve learned so much! I’m really looking forward to seeing what videos you post up next and testing some recipes for myself. JT: Again, thank you for giving me the opportunity to share what we do! Interested in 18th century living? Visit the Jas. Townsend & Son Inc. online store.